[Pomona Park, Fla.] The Floor Covering Industry Foundation (FCIF) is there when its needed most. Just ask Rene Peterson who worked for Taylor Carpet One for 10 years as a sales consultant, store manager and most recently sales manager. 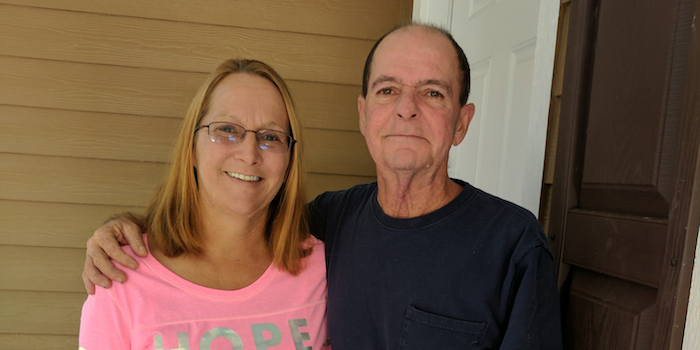 Her husband of 14 years Robert Peterson (who also worked for Taylor Carpet One for a few years) was diagnosed with lung cancer and a brain tumor — the shocking diagnosis left him with decreased mobility and unable to work. Less working hours and medical treatment and doctor visit bills were a challenge. A decision was also made to move closer to their family. “Moving to a smaller house became a need instead of a want,” Rene Peterson said. However, she recalled reading about the Floor Covering Industry Foundation in FCW. For over 35 years, the Floor Covering Industry Foundation (FCIF) has been helping members of the flooring industry in times of need. The foundation benefits current or previous employees of the floor covering industry by providing grants that go towards paying for medical treatment, therapy and other supplies — sometimes even food and rent. As a resource for members of the flooring industry who are experiencing illnesses, injuries and other severe medical disabilities, The Petersons turned to FCIF—and the foundation was there to help. For more on the Floor Covering Industry Foundation, visit fcif.org.